Telenor Pakistan, as one of the project sponsors, has provided financial assistance to Pak Wheelers, a group of 11 engineering students of EME College, NUST, Islamabad to build Prodigy, Pakistan’s first hybrid car. 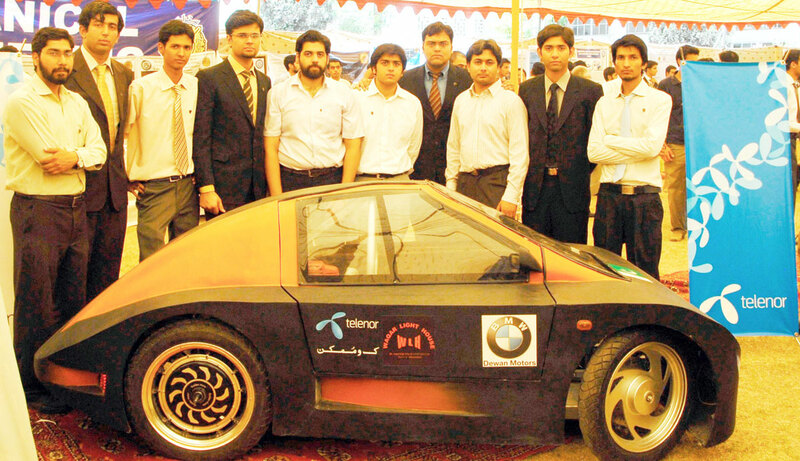 The vehicle will represent Pakistan in the Shell Eco-Marathon Asia 2010 to be held in Malaysia in July. Telenor Pakistan will provide Team Leader Syed Hassaan Ali with international communication facilities during the competition to enable him to share live updates. The single-seater Prodigy has a gasoline-run combustion engine that works in conjunction with electric motors that makes it run more efficiently. It harvests energy lost during breaking and reuses it for moving. Energy is stored in super capacitor banks through a micro controller based Energy Management Unit. Prodigy has a fiber glass body and can go up to 250 km in just one liter of fuel. When Pak Wheelers began their senior year project, they had a commitment to an environment friendly cause but little financial resources. Their goal was to hoist Pakistan’s flag in the Shell Eco- Marathon Asia 2010. Helping them in their aim are sponsors from the corporate sector that have provided financial support for Prodigy. Telenor Pakistan has been a responsible corporate organization since its inception. In addition to a number of initiatives, Telenor Pakistan recently took up the challenge of changing perceptions and lives of persons with disabilities through its flagship corporate responsibility program, Khuddar Pakistan. With immense support from the community, these efforts have translated into sustainable corporate responsibility initiatives. Telenor Pakistan also extends its support to environment friendly initiatives. Recently, Telenor Pakistan employees in Islamabad planted trees in Margalla National Park and pledged a second round in the monsoon season to plant and care for another 1,500 trees in collaboration with CDA. So what’s the new definition of liter then? Telenor is the fantastic tele communication company providing great services. They (Pak-Wheelers) were claiming that they have improved the design to get 700Km/L instead of 450Km/L REF: https://propakistani.pk/2010/05/12/nust-students-design-pakistan-first-hybrid-car/ …. and now it is just 250Km/L … so what went wrong???? Websterz also supporting this group. and proud to providing all web base services. Websterz also supporting new talent in Pakistan. for more information please visit on http://www.websterz.net , ur complete web solution.